RTC: Stephane Aguilar markets SNG flyaways from China. Frenchman Stephane Aguilar has set up a business in Hong Kong to market and export SNG equipment that's been manufactured in China. 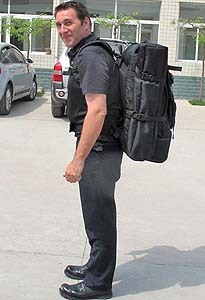 His company, Radio Technique Communications, has sourced flyaway Ku-band antennas that are very light-weight and can be folded up to fit in a backpack. In addition, he will soon be offering a roof-mounted antenna for vehicles. Stephane - who is an electronics engineer and used to work as a SNG engineer for Satellite Prod - told TVZ: "We can offer two advantages: price and quality. We have selected good quality products and not cheap ones - there are a lot of those on the market." He believes the quality of his Chinese-made flyaways equals that of many similar products manufactured in Europe and elsewhere. However, the prices of the Chinese systems are substantially lower. "The leading brands in Europe are twice as expensive as the ones we can supply," he said.